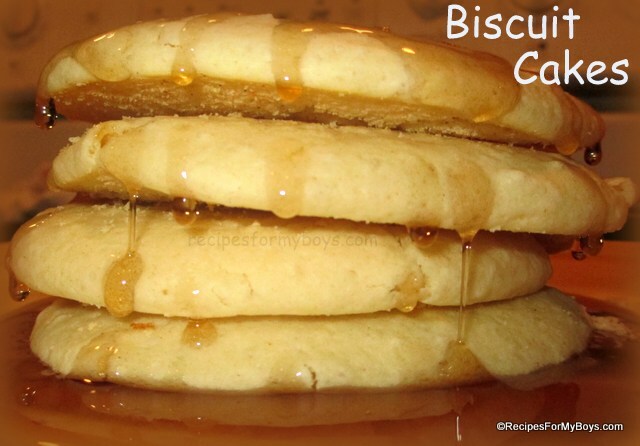 Biscuits and syrup. Do you remember that? Do you still eat it? I think I ate it every time my precious Mama made her fabulous homemade biscuits. It was soooo good. I would eat just the biscuits, all broken up, covered with syrup. I know, but when something is that good ... you just can't help yourself! Bake yourself some biscuit cakes and eat them instead of pancakes. You will love them! *I think buttermilk will work well instead of making sour milk ( milk and vinegar) although I have not tried it. Add 2 Tablespoons vinegar to an one cup measuring cup and fill with milk to one cup level. Set aside. You want it to be like thick. Put 2 cups biscuit mix, Homemade, in a large mixing bowl and whisk to break up any large lumps. Add enough soured milk to make a very thick pancake batter. I usually use 1 cup but start a little less, depending how thin the milk is. Let sit 5 to 10 minutes, it should look spongy almost when stirred. Preheat oven to 350 degrees F. while waiting. Spray baking sheets with non-stick spray or use, Homemade Cake Release. Ladle 1/3 cup batter on baking sheets. Cook 5 minutes until lightly brown on bottom and flip over, cooking another 2-4 minutes until set. You can also let them cook without turning over, until done. Top with butter or margarine and syrup, honey, fruit, preserves.....Enjoy!